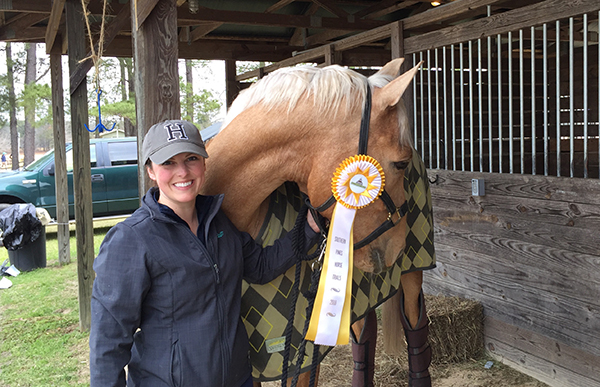 After our successful outing at the Southern Pines Horse Trials, I can’t help but turn my attentions to what’s next. Of course everything, and I do mean everything, when it comes to horses has to be written in pencil instead of pen, but still it is good to have goals. Speaking of goals, I realized that my Goals and Results pages have been thoroughly neglected ever since things with Foster fell apart. Expect updates there shortly! 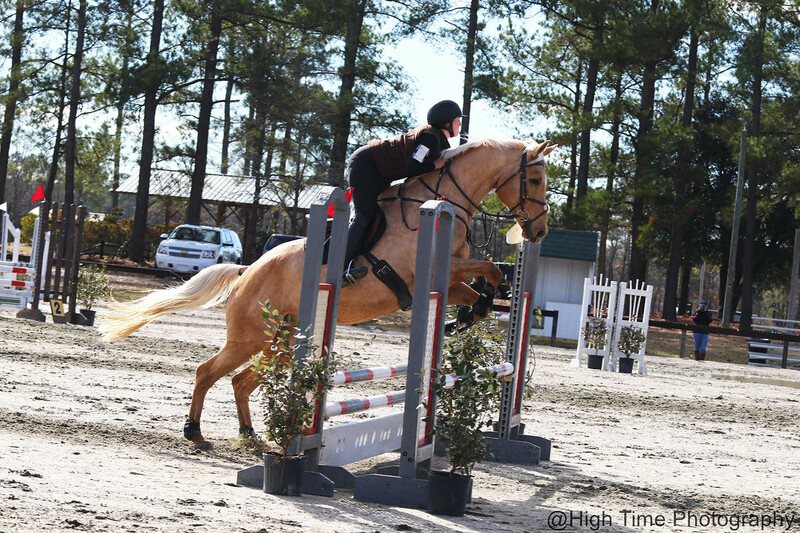 After SPHT, the next big thing on the schedule is another show at the Horse Park, this one April 21-22- the Longleaf Pine HT. 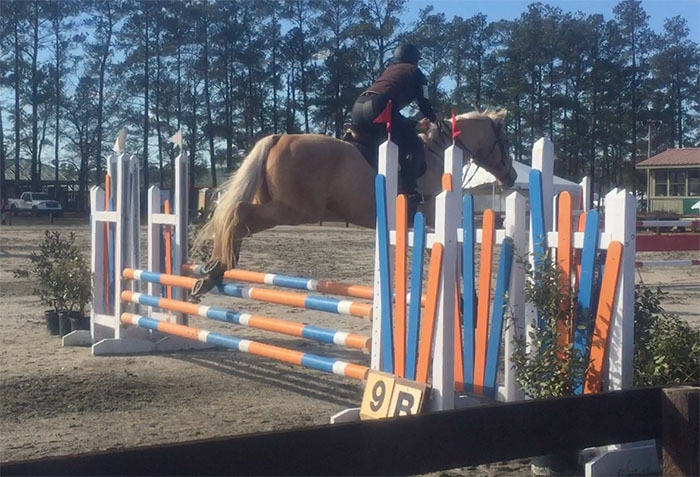 Sorry not sorry if you’re bored by how often I go to the Carolina Horse Park. I freaking love that place. 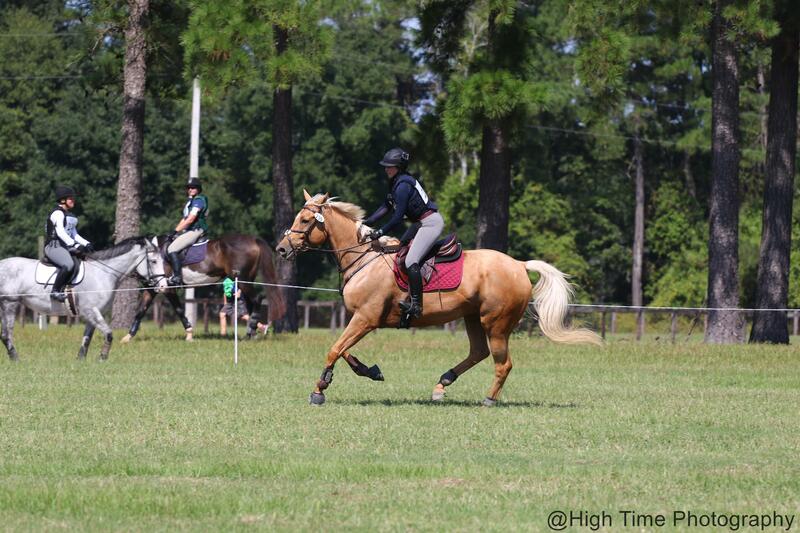 So trainer and I discussed what to sign up for, and she feels confident that Novice should be very doable. So, with that said, one month from now we’ll be eyeing our official move up. Hearing that recommendation from my trainer made for 1 part eye bulge, and another part relief that BN could be a thing of the past. This is where the whole pencil spiel comes in, because who the heck knows what could happen in the next month, so this should all be taken with a heavy does of salt. Because, you know, horses. So now I’ve got a new test to start memorizing, and prepping to do. Not only does Novice B have another stupid diagonal-centerline combo, but it also has the dumb turns from B to E right across the arena. But even still, I’m tentatively excited to be maybe (maybe maybe maybe) back at Novice next month! Sunday morning I did my final walk through of the cross country with the trainer, and got a bit of a knowledge drop on how best to navigate what was a very friendly looking course. We discussed the need to really ride to fence 4, which was giving some people trouble with its spooky grain bags. 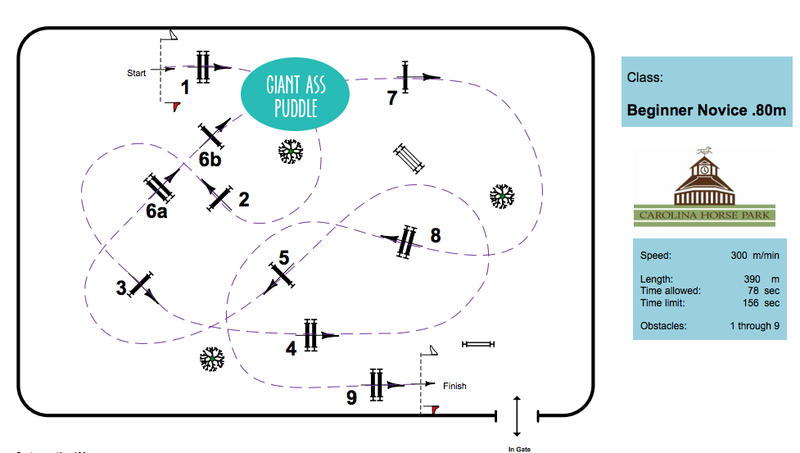 Likewise to swing wide to fence 7 so the right run-out towards the barns wasn’t so tempting. All in all, it was a great run. While he needed a little convincing in the beginning, we eventually found a rhythm. It was a blast letting him go a bit up the big hill after fence 10, and I can feel that Novice speed is going to be nothing for Jack. In fact, we did our course at 375 meters/min which was the marked Novice speed for the event. Hence my wondering about speed faults at the end of our round. Each outing, Jack gets more and more confident, and throwing down a double clear round and became more and more rideable as we went along was an amazing feeling. He still needs support and confidence from me, but we’re feeling more like a team. 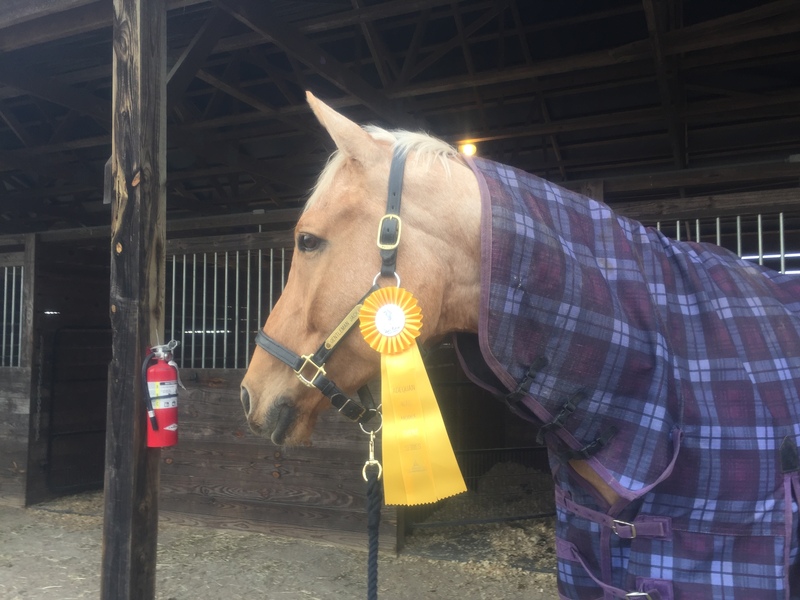 Because I blazed around the XC, we lost the tie breaker for 2nd, and the yellow pony earned a matching yellow ribbon for his efforts. But to be competitive at his first recognized show is an awesome feeling, and I couldn’t be more thrilled with the weekend. Sunday we went to the Pinehurst Harness Track to get some more mileage at Beginner Novice Test B, which is the test for the big recognized doozie this weekend. Instead of doing 2 different tests, I actually chose to do BN-B twice, and save some precious brain cells in the process. We got to the Harness Track and squeezed into a spot along the rail (thank goodness for my teeny rig), got Jack tacked up and hustled to the warmup. He had gotten Perfect Prep Gold the day before, and PP Supreme before getting on the trailer, and I don’t know if it was that or just happenstance but while alert and looking around, once I was in the tack he gave me the best warm up to date. Following that, we had roughly 15 minutes before going back in, and made good use of a warm up area just outside the ring so that we could get his attention focused on me near scary K. It worked, and while test B felt better in many ways, Jack got the idea to start hollering through pieces of it, which apparently the judge didn’t like. We got a 70.25% (29.75) for that one. Nothing like being consistent, eh? 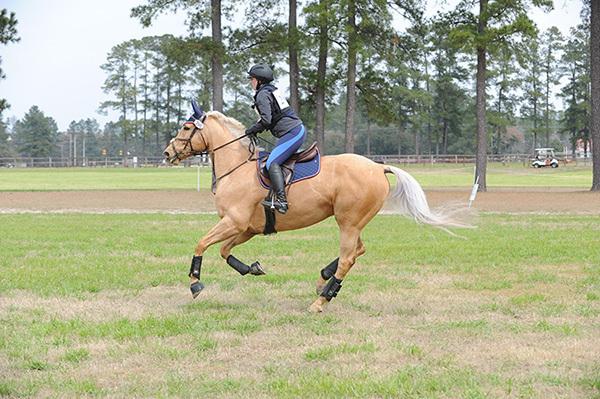 As you can see, the highlights in both tests were the left trot circle, left lead canter, free walk, and final centerline. Everywhere else there are subtle differences, as he was tense in different places between the two tests. In general, I’m pretty thrilled with the outing. 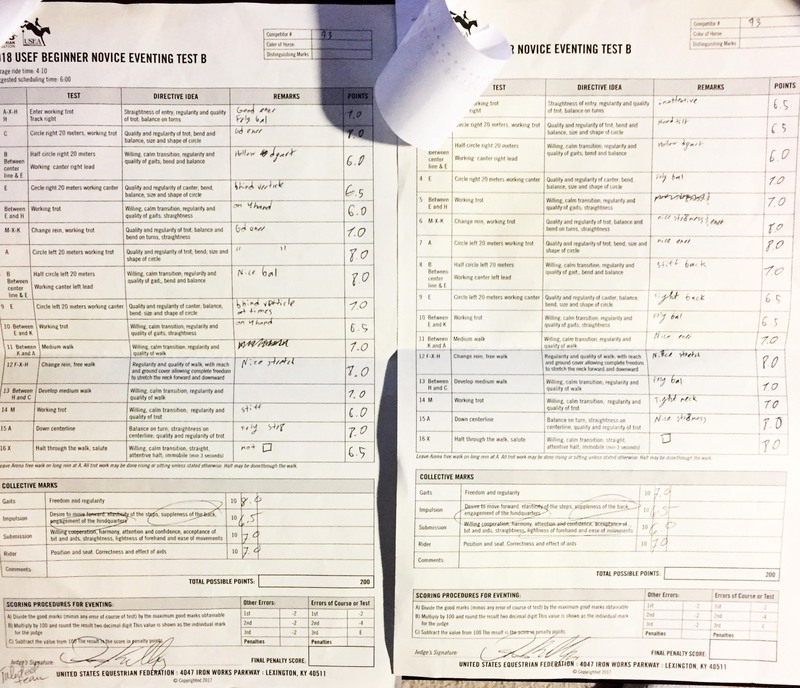 Jack got some more experience in the dressage court, I got to test out Perfect Prep products, and we achieved our goal (albeit barely) of scoring in the 20s. 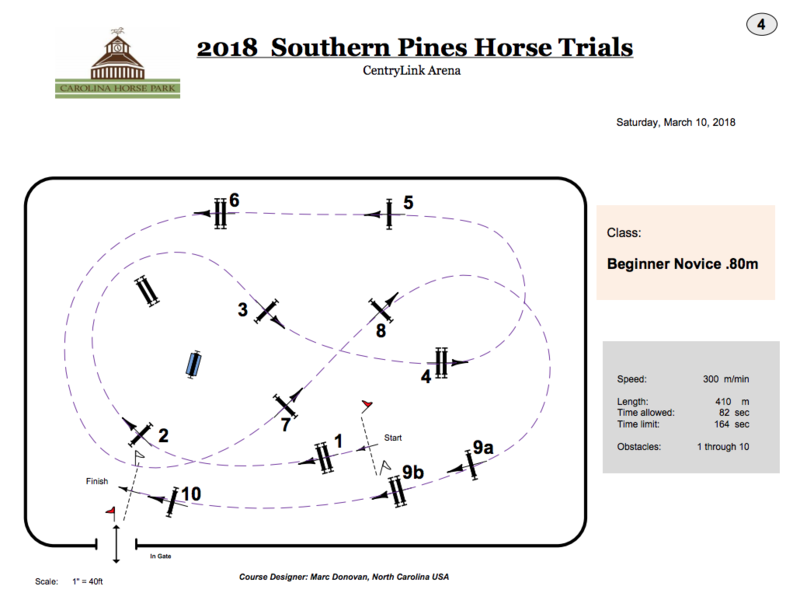 Our dressage trainer got to see him in a show environment and help us formulate a plan for the warm up at the Southern Pines HT. So all in all, despite no blue ribbons, it was a big win-win! Expanding on yesterday’s dressage recap, after dressage I was slightly meh about my test, but determined to still give a good go of the showjumping. 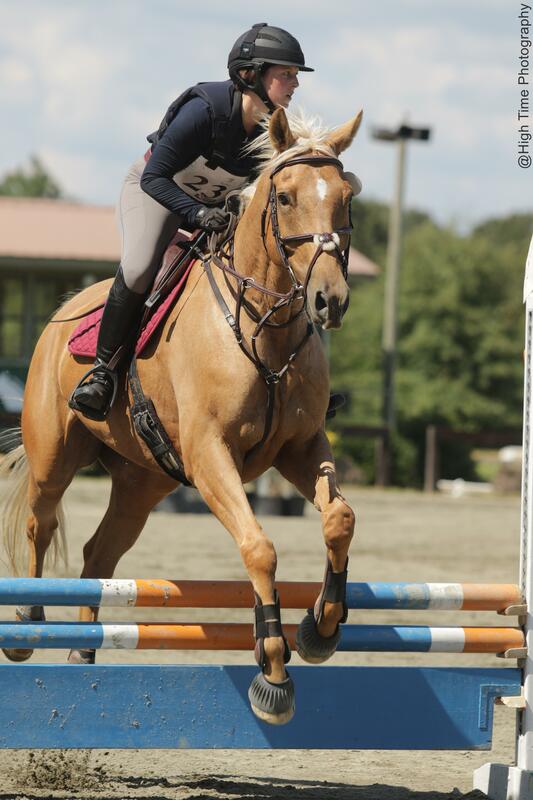 I paid in advance for an extra round, with the expectation that he would be his normally spooky self in the show arena (which he was) and give him a more confidence building experience the second time round. 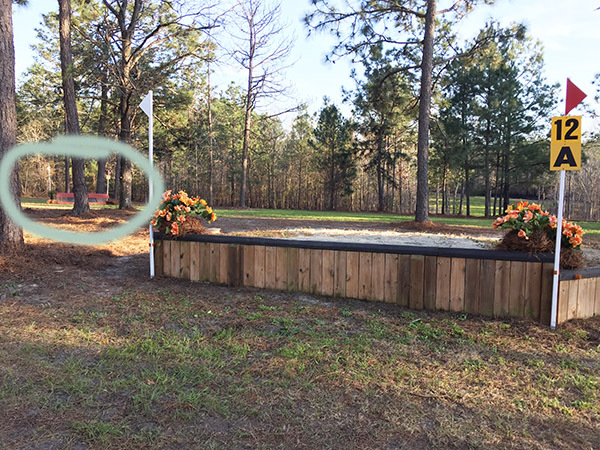 Since Jack started out being looky at the lakes puddles that dominated the facility that day, I purposely got his feet wet over and over again in the warmup ring- not hard to do when the “puddles” are almost 20′ wide. This gave me hope that I wouldn’t be swimming once we got into the arena proper, since there was literally no approach from 6B to fence 7 that avoided a splash zone. After confidently navigating the water, we had a beautiful warmup, thanks to friend C channeling the trainer’s words from Tuesday’s lesson. I actually felt like my leg was under me, and for the most part that my shoulders were back, and Jack felt lovely and supple and relaxed. Where is that horse for dressage?? 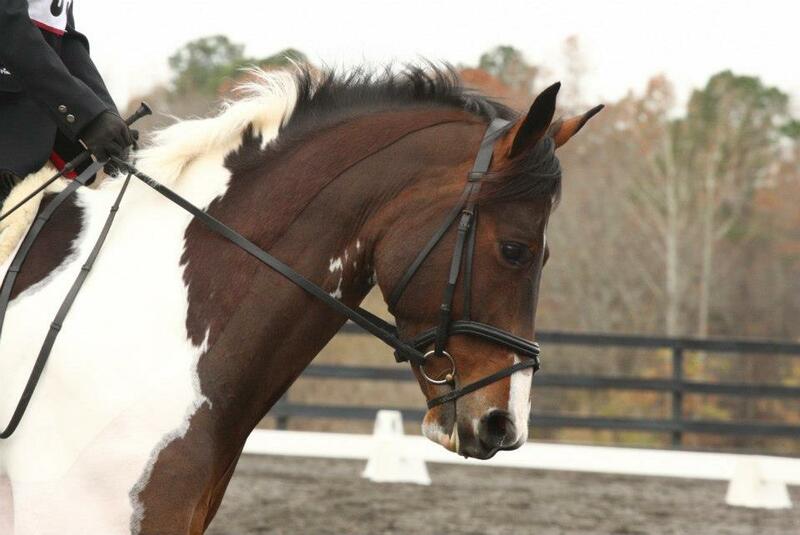 She helps me tack, warm up, and video- also her hair is fabulous! But all that relaxation went away as predicted the moment we stepped into the competition ring. Just like all the previous times, he would basically ping off of all the fences while I tried to assure him these were fences of the non-horse-eating variety. Enter again lots of verbal praise to calm the big weenie. Beyond that, we had a decent go. Except for this. Right here. 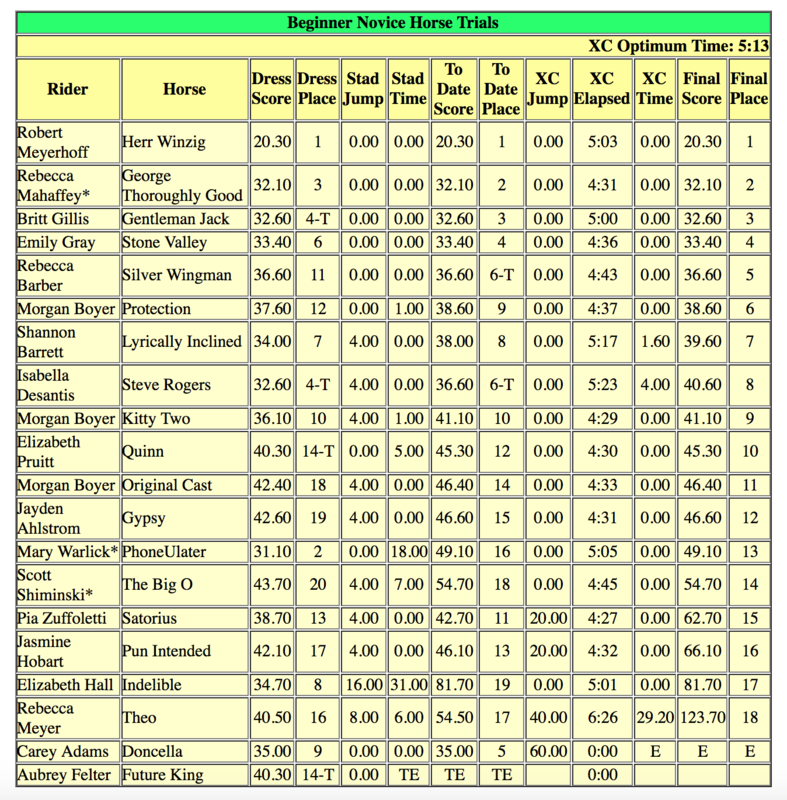 On the last fence, and the last foot over- cost us a rail that moved us from a potential 3rd place to tied for 7th. We sat around for 20 minutes and came back in for our schooling round, and I was shocked to find Jack more spooky on re-entry than before. I can only figure that he was tired at this point and backed off. 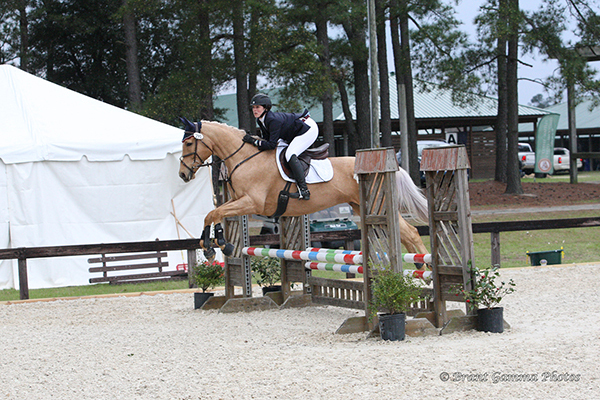 So we really didn’t get to smooth anything out until after fence 4. You’ll see in the video that he comes back to a trot, and I think the adrenaline wore off and I actually was able to give him more of a decent ride than before. Overall, I’m really happy with the big blondie. We got all our leads, and even though we got a couple wonky spots (including a deep one I asked him for- sorry buddy but waiting is a thing), in general it felt way smoother than our last time there in November. 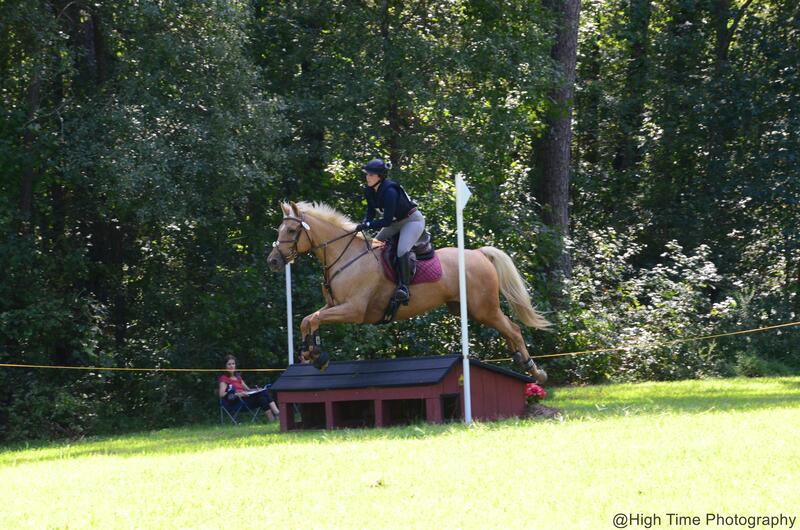 I believe the plan is to shoot for Novice height at the next SJ outing at the end of January. 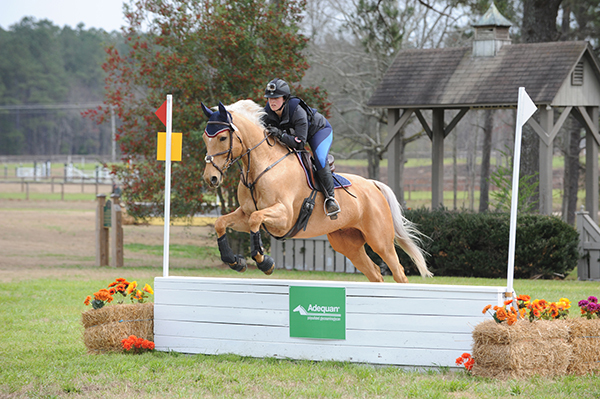 We’ve also got a cross country schooling this weekend if the weather cooperates! All the things!!! 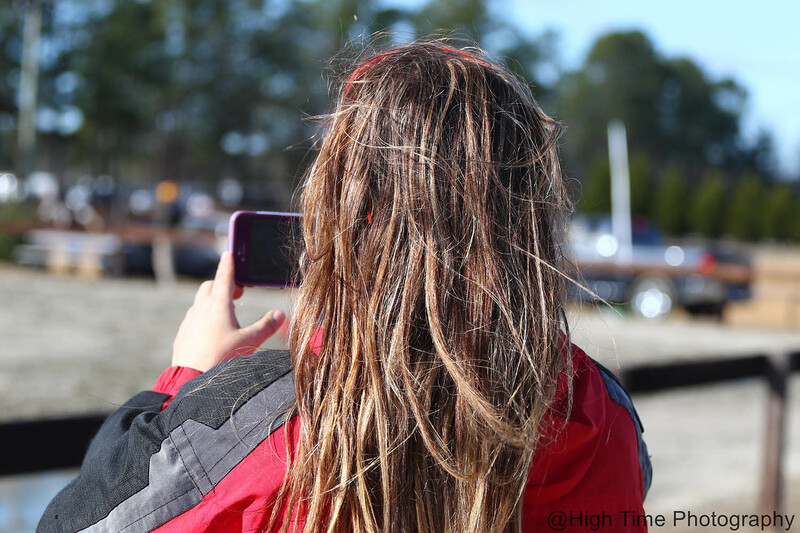 Having walked my course three times I felt confident that THIS time, I had no excuse for any kind of amateur moment. I knew that thing backwards and forwards, and though my feet hated me, I was sure I would remember my way around all 17 obstacles. The course was nice in that it built in difficulty as it went along. Fences 1-4 were really straight forward, with the first question being a log pile on a slanted hill at fence 5. From there you went through the water and out over an inviting roll top, straight on to the world’s widest BN fence, and then a nice gallop up and down terrain to some combinations. The second combination was what I was most unsure about- a log pile, followed by a U-turn left to a down bank and then slight bending line to a roll top. The only time I had ever done a bank with Jack was during the trial period, and that was only once down a baby (18″) bank. But I figured if I kicked on we would be fine. 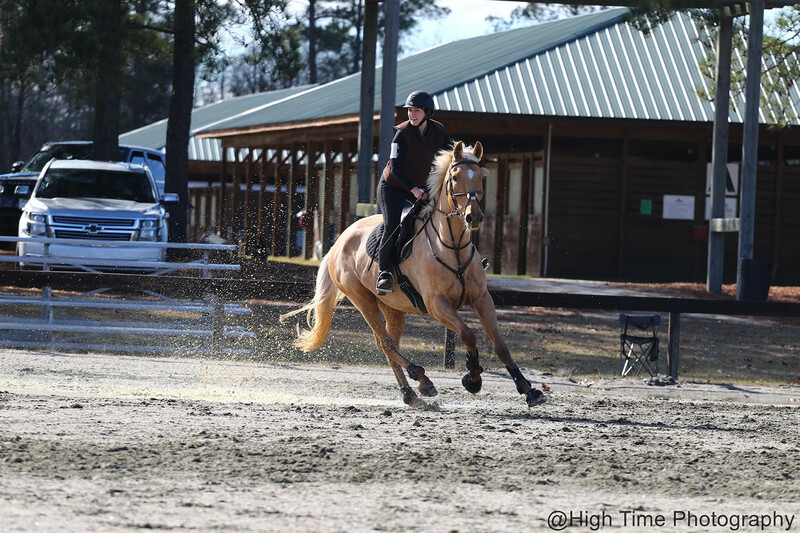 One thing I noticed he struggled with at the last show was cantering down hills- Jack wants to come back to a trot immediately- so I decided this was an excellent thing we could practice to stay in rhythm through this course. My constant nattering will tune you in to where he shined, though it’s hard to tell from this vantage point where I felt him backing off or losing straightness as he made his way around the course. Fence 4 may have been “not cute” because we both got distracted by a person walking behind it, and a car driving behind it that you can’t see on video. The bank was a little bit of a scramble as well. All in all I was beyond thrilled with how he built confidence through the course, and I admit I’m proud of myself for kicking on, even if I wish I was a little less talkative on course. 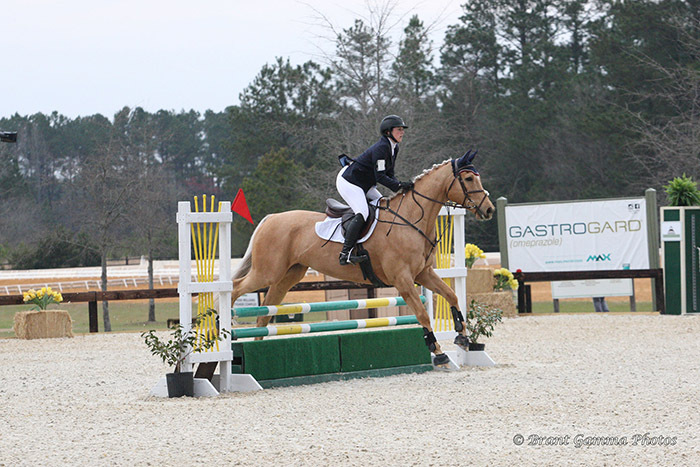 Our double clear round helped us stay in 3rd place- just .5 points out of contention for the bottle of wine that was 2nd place’s prize, and a healthy 10 points behind 1st- but considering Bobby Meyerhoff ran Rolex this year, I’m OK with that. The show was a great way to end our short little season, and I have to say- I’m becoming a heck of a fan of the big banana boat!